Common sense tells us that humans and chimpanzees are not really that much alike. Amazingly, Darwin's Cheerleaders insist on using the idea that similarities in human and chimpanzee DNA is a really big deal, but there are many differences. In fact, there are irreconcilable differences in brain cells as well. 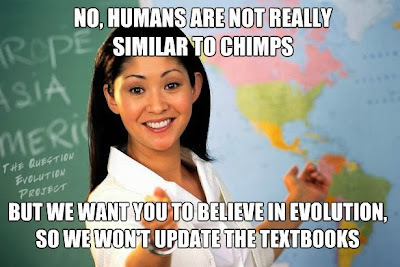 Evolutionists are trying to explain away the data, and creationists are happy to be proved right. Again. New research adds to an ever-lengthening stream of discoveries that confirm exactly what a Bible-believing scientist would expect—humans are distinct from chimpanzees. They should be, if they were created in the image of God, not as an imaginary pre-human primate. The study, published in American Journal of Human Genetics, investigated DNA methylation patterning in human and chimpanzee brains.Two observations from this research support the biblical origins of mankind. In a process called methylation, cell systems add methyl groups to some regions of chromosomes. DNA methylation patterns are different in brain cells than they are in muscle cells, for example, and they differ between individuals and species. They do not change the genetic code, but they regulate some genetic functions. Therefore, they comprise a level of information separate from the genetic code. Studies show that they provide critical regulation of the activity of DNA-manipulating enzymes both during embryonic development and during the daily life of adult cells. When methylation patterns are errant, they cause gene malfunction and can lead to disease. Some types of abnormal methylation patterns are lethal. You can read the rest of "Stark Differences Between Human and Chimp Brains", here.